Design and manufacture of seating components and assemblies represent some of the trickiest aspects of automobile production. Simply stated, seats challenge engineers as they must simultaneously satisfy goals related to safety and health, as well as driver and passenger comfort. Seating components—including their many stamped and fabricated metal parts—must account for ergonomic considerations, vibration suppression and strength. Accu-Rite programmer Mike Winkler explains how with just a few mouse clicks, programming moves from the CAD part model to cutting-fixture design (with supporting-rib geometry included), and on to cut-path formulation. The software considers cutting-machine and cutting-head kinematics and geometry to eliminate collision hazards. Key to the remarkable advances made in automotive-seating engineering is prototype development, the specialty of Accu-Rite Industries, Shelby Township, MI. The firm works with several OEMs and Tier One suppliers to develop reclining-mechanism components, slide tracks, shells and frame parts, reinforcing brackets, hinges, latches and locks. Amongst the tools in the firm’s proverbial manufacturing toolbox are, of course, stamping presses (350- to 750-ton hydraulic models), as well as press brakes, machining centers and coordinate-measuring machines. The newest star on its shop floor: a five-axis 3D laser-cutting machine, a TLH-series model from NTC America, with a work envelope of 177 by 45 by 20 in. Equipped with a 2-kW fiber laser, the state-of-the-art workhorse boasts cutting and positional accuracy rated to 0.0015 in., and a pallet changer to optimize throughput. 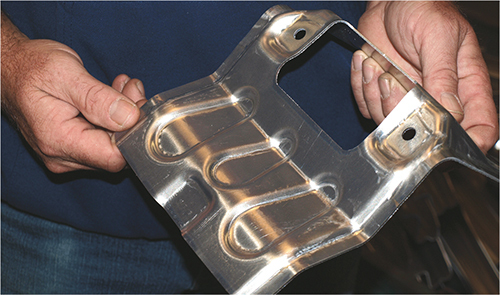 It takes Accu-Rite’s ability to trim stamped prototype parts to a new level of efficiency and quality. “We need the highest levels of accuracy available in the industry,” says Accu-Rite vice president John Loudon, “to keep up with demands from our customers.” Tolerances, he says, often are specified at ±0.05 mm on stamped parts. With that much cutting speed at the ready, part of the responsibility for moving work quickly through the shop falls to the laser-programming function. And Loudon and Mickovski couldn’t be more pleased with the programming solution they invested in several years ago—CAD/CAM software from German-based Tebis (with U.S. operations in Troy, MI). The newest star on the Accu-Rite shop floor is this five-axis 3D laser-cutting machine, with a work envelope of 177 by 45 by 20 in. and equipped with a 2-kW fiber laser. “We trust Tebis with our millions of dollars invested in our state-of-the-art laser-cutting equipment,” says Mickovski. Among the noted features in the Tebis laser-cutting CAM module, as noted by Accu-Rite programmer Mike Winkler: With just a few mouse clicks, programming moves from the CAD part model to cutting-fixture design (with supporting-rib geometry included), and on to cut-path formulation. The software considers cutting-machine and cutting-head kinematics and geometry to eliminate collision hazards, while also minimizing major rotational movements. Winkler employs the software to program all five of the firm’s 3D laser-cutting machines; machine data—physical dimensions as well as cutting-process capabilities —is contained within the Tebis database. 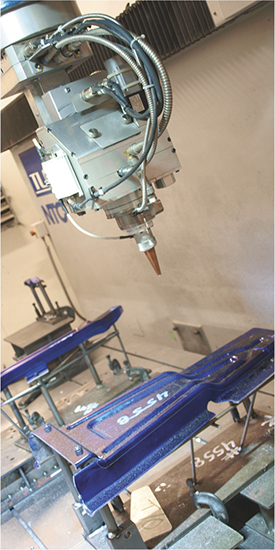 With programming and cutting time optimized, quick turnaround to customers becomes less of a worry, say Mickovski and Loudon. While most of Accu-Rite’s prototypes are of high-strength steel, its volume of aluminum stampings has been on the rise. Here, programmer Mike Winkler points out some of the tricky contours the five-axis laser-cutting machines must navigate. The Tebis CAM software helps to ensure that the process meets the required tight tolerances on cut angle and edge quality. Winkler says that he can program some of the shop’s simpler parts in just 15 min., and complex parts take only an hour or so of programming time. Should the operator on the floor, in that rare instance, need to make any modifications to the NC program at the machine, Winkler notes that those modifications can easily be reversed back into the NC job via its relatively simple editing functions. In addition to laser-cutting productivity gains through the use of Tebis software, Winkler also notes improvements in cut quality and in eliminating extra and excessive laser-head movement. This adds up to minimal, if any, secondary operations to clean up cut edges, and reduces maintenance concerns with the cutting equipment. 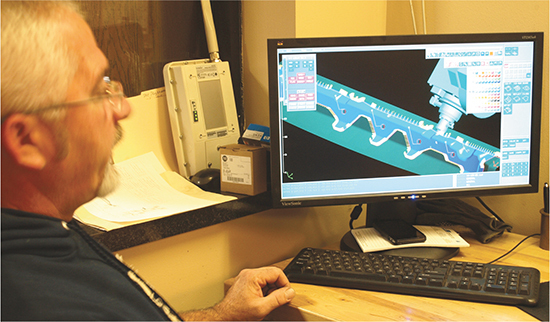 “Compared to other CAM programs that triangulate the data to derive cut paths,” says Winkler, who has been programming Accu-Rite’s lasers since the firm brought the technology inhouse in 1998, “Tebis uses digital data. This provides greatly improved blending of data points. So, our cuts look better and edge quality is optimized—we rarely if ever have to post-cut sand or machine the cut edges before shipping the parts off to our customers. See also: , Tebis America, Inc.